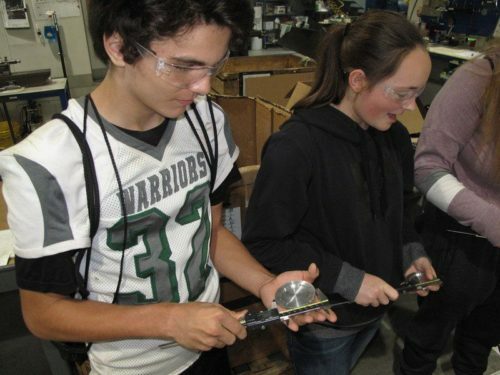 Record Turnout at Manufacturing Day | Hayes Manufacturing, Inc.
FIFE LAKE — Every student who toured Hayes Manufacturing, Inc. left with an aluminum medallion. Some left with a potential career. 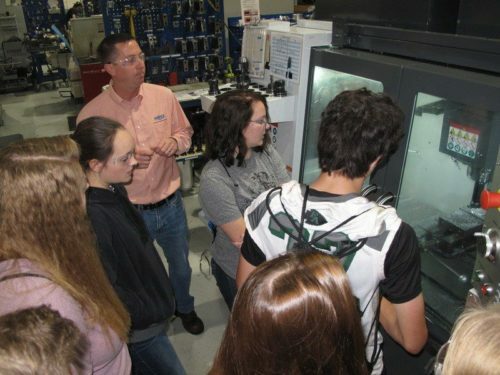 The Fife Lake plant was one of 43 manufacturers hosting nearly 1,000 area students for fifth annual Manufacturing Day. Hayes Manufacturing had students in three different groups move through a three-step process in producing a medallion: Engineering, machining and quality control. Two ninth graders at Forest Area High School said they could see themselves in the manufacturing industry in the future. “I really enjoyed it,” Xander Whisker said. “I’m actually thinking about going into manufacturing for work. I’m really interested in this type of work.” “I like being able to put a plan together and make it,” added classmate Jacob Wieling. “Having something that you made makes you feel good.” The first Friday in October marked the third time Hayes Manufacturing has participated in the region’s fifth Manufacturing Day. Matt Schwarze, Grand Traverse Area Manufacturing Council secretary who works in business development at Northwestern Michigan College, said nearly 1,000 students toured 43 different manufacturers on Friday. He said Council Workforce Development Chair Emily Challender has helped grow the national event on a regional level. “It was fantastic,” Schwarze said. “Obviously it was a record year, but there’s even more room to blow it up even bigger next year.” Challender, who ironically works at Hayes, helped make the tour of the Fife Lake company more interactive as a way to “engage” the students, said Hayes Engineering Manager Mike Lawson, who is also one of the five owners of the company that has been in Fife Lake since 1990 after being located in Manton from 1973-90. Even with the more interactive tour, Hayes isn’t going to land a whole new employee work force. But that’s not the purpose of Manufacturing Day. 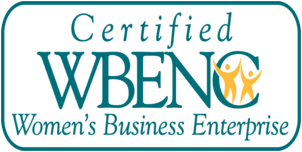 “If we can touch one, two or even three kids, that’s what we’re hoping for,” said Lawson, who ran the manufacturing demonstration and had students raise their hands if they were interested in manufacturing. Some groups of the Forest Area students showed an interest; others did not. “Manufacturing isn’t just working in a factory building something,” added Design Engineer Zeb Sieting, who made sure to tell the students that he was a Forest Area alum.